If your growing awareness of global health and child survival issues makes you want to roll up your sleeves and start making a difference, there are many organizations throughout the world that offer ways for you to get involved. You can learn more about the groups listed here and many others by visiting their web sites and checking out resources that provide information on charitable organizations to help you make informed decisions. One such resource is Charity Navigator (www.charitynavigator.org). The Academy for Educational Development works in all the major areas of human development, with a focus on improving education, health, and economic opportunities for the least advantaged in the United States and developing countries throughout the world. For over 20 years, AED has worked in child survival, with specific expertise in infant and child nutrition, immunization, hygiene improvement, and prevention and treatment of malaria and diarrheal disease. As a nonprofit organization committed to solving critical social problems, AED operates more than 250 programs to help individuals and communities in 150 countries and all 50 U.S. states. AJWS helps to alleviate poverty, hunger and disease among the people of the world regardless of race, religion or nationality. Their grant making emphasizes the link between human rights and sustainable development and supports community-based organizations in the developing world that are undertaking programs addressing economic development, education, healthcare and sustainable agriculture. Bread for the World is a nationwide Christian citizens movement seeking justice for the world's hungry people. BFW does not provide direct relief or development assistance. Rather, it focuses on using the power of citizens to support policies that address the root causes of hunger and poverty. Working with poor communities in 70 countries to create lasting solutions to poverty, CARE is one of the world's leading international humanitarian organizations. CARE is committed to helping families improve their lives and overcome poverty through programs aimed at empowerment, equity and sustainability. As the official international relief and development agency of the US Catholic community, Catholic Relief Services operates around the world to aid the poor by first providing direct assistance where needed, then encouraging people to help with their own development to foster secure, productive, just communities that enable people to realize their potential. PlanUSA is a global partnership dedicated to bringing hope and help to the world's poorest children. Childreach is a program within PlanUSA that enables sponsors to make a difference in a child's life by supporting benefits like safe drinking water, improved education and health care, and increased family income in countries where such benefits are often almost unattainable. Founded by a Presbyterian minister, CCF assists children and families in 32 countries, including the United States, regardless of race, creed, or gender. The support of child sponsors and donors enables CCF to help children lead healthier, safer lives by providing them with improved access to health care and safe water, immunizations, better nutrition, educational assistance, literacy courses, skills training and other services specific to their individual needs. CCF programs promote long-term sustainable development and are designed to help break the cycle of poverty. The CORE Group is a membership association of U.S. non-governmental organizations working to strengthen local capacity on a global scale to improve the health and wellbeing of children and women in developing countries. They do this by guiding community-based child and maternal health programs, collaborative activities to promote scaled-up community-based programs, building public and private resources, and policy forums. Médecins Sans Frontières (also known as Doctors Without Borders) delivers emergency aid to victims of armed conflict, epidemics, and natural and man-made disasters, and to others who lack health care due to social or geographical isolation. Every Child By Two strives to raise awareness of the need for timely immunization and to establish a systematic method to ensure the immunization of all of America's children by the age of two. FCI works internationally to address a range of urgent health issues within a framework of a comprehensive, women-centered approach to reproductive health. Its work encompasses family planning, unsafe abortion, and gender violence, with a particular emphasis on safe motherhood and adolescent sexual and reproductive health. Feed the Children is a Christian, international relief organization that delivers food, medicine, clothing and other necessities to individuals, children and families who lack these essentials due to famine, war, poverty or natural disaster. A key goal is to help needy families move past needing help and into becoming self-sufficient members of their community. Working in 25 countries around the world, Helen Keller International's mission is to save the sight and lives of the most vulnerable and disadvantaged. Helen Keller International combats the causes and consequences of blindness and malnutrition by establishing programs based on evidence and research in vision, health and nutrition. Interchurch Medical Assistance was founded to represent Protestant relief and development agencies in procuring and shipping donated medicines and medical supplies from U.S. pharmaceutical companies to overseas health ministries. In recent years, it has begun to implement a number of other health development and disease intervention projects. The Interfaith Alliance and The Interfaith Alliance Foundation are the national non-partisan advocacy voice of the interfaith movement. Members of more than 70 faith traditions work to promote interfaith cooperation around shared religious values to strengthen the public's commitment to the American values of civic participation, freedom of religion, diversity, and civility in public discourse and to encourage the active involvement of people of faith in the nation's political life. Established by volunteer doctors and nurses, IMC staff and volunteers are united in their mission to save lives and alleviate the suffering of those affected by war, disease, and devastation. IMC places special emphasis on training local medical personnel in the skills and knowledge needed to rebuild their own health care systems. The ICRC is an independent, neutral organization ensuring humanitarian protection and assistance for victims of war and armed violence. The ICRC has a permanent mandate under international law to take impartial action for prisoners, the wounded and sick, and civilians affected by conflict. Headquartered in Geneva, Switzerland, with bases in 80 countries, in situations of conflict the ICRC coordinates the response by national Red Cross and Red Crescent societies and their International Federation. Founded in 1984, the International Women's Health Coalition works to build political will and influence the policies of governments, donors, and international agencies to secure girls' and women's sexual and reproductive health and rights. The IRC is a global leader in emergency relief, rehabilitation, protection of human rights, post-conflict development, resettlement services and advocacy for those uprooted or affected by conflict and oppression. The ISNA is an association of Muslim organizations and individuals that provides a common platform for presenting Islam, supporting Muslim communities, developing educational, social and outreach programs and fostering good relations with other religious communities, and civic and service organizations. Lions Clubs International Foundation (LCIF) is the grant-making arm of Lions Clubs International, the world's largest service club organization. SightFirst is LCIF's program to prevent blindness. SightFirst has prevented serious vision loss for 20 million people and restored vision to 4.6 million people with cataract. SightFirst has partnered with the World Health Organization to establish 30 pediatric eye care centers around the world to prevent childhood blindness. SightFirst Campaign II is under way to raise $200 million to prevent blindness in children and adults worldwide. Management Sciences for Health is working to close the gap between what is known about public health problems and what is done to solve them. MSH works with partners worldwide to improve the management of and access to health services such as primary health care, child survival, maternal and child health, family planning, and reproductive health through technical assistance, training, applied research, publications, and fellowships. The mission of the March of Dimes is to improve the health of infants by preventing birth defects and infant mortality. The organization carries out this mission through research, community services, education and advocacy to address threats to infants' lives: premature birth, birth defects, and low birth weight. The March of Dimes also works in Central and South America and reaches out to all Latina women through its Spanish-language Web site. Mercy Corps provides emergency relief services that assist people afflicted by conflict or disaster; develops sustainable communities that meet the needs of children and families (including agriculture, economic development, health, housing and infrastructure, and strengthening local organizations); and promotes civil society initiatives in all its programs to encourage citizen participation, accountability, nonviolent conflict management, and the rule of law. ONE is an effort to rally Americans one by one to fight the emergency of global AIDS and extreme poverty. Through a diverse coalition of faith-based and anti-poverty organizers, ONE shows the steps people can take to fight global AIDS and poverty. Oxfam International is a confederation of 12 organizations working together with over 3000 partners in more than 100 countries to find lasting solutions to poverty, suffering and injustice. Oxfam seeks increased worldwide understanding that economic and social justice are crucial to sustainable development, and strives to be a global force promoting the awareness and motivation that comes with global citizenship while seeking to shift public opinion in order to make equity the same priority as economic growth. The Pan American Health and Education Foundation is an independent philanthropic organization working to combat disease, lengthen life, improve health care services, foster health research, and enhance the capacities of health care workers in the Americas through grant-making and direct program implementation. The Foundation works to promote philanthropy as a core social value, and shares the Pan American Health Organization's vision of Health for All. The PAHEF web site features success stories — projects that achieve a positive impact on the health and the lives of peoples, including children — in hopes that they will inspire others. Partners In Health operates in Latin America, the Caribbean, Russia, and the United States. By establishing long-term relationships with local organizations in areas of poverty, and drawing on the resources of the world's elite medical and academic institutions, PIH works to bring the benefits of modern medical science to those most in need of them and to combat despair. PATH (Program for Appropriate Technology in Health) helps families and communities in some of the poorest settings give their children a healthy start in life through innovative approaches to newborn care, immunization, nutrition, and other primary health care needs. Working in over 20 countries throughout Africa, Latin America, Asia, and the Near East, Pathfinder is committed to making family planning and reproductive health services available to all who want them. By partnering with local governments and grassroots organizations, Pathfinder creates programs that are responsive to the needs of individual communities. The mission of Project HOPE (Health Opportunities for People Everywhere) is to achieve sustainable advances in health care around the world by implementing health education programs, conducting health policy research, and providing humanitarian assistance in areas of need. Identifiable to many by the S.S. HOPE, a hospital ship, Project HOPE now conducts land-based medical training and health care education programs on five continents, including North America. RESULTS is committed to creating the political will to end hunger and the worst aspects of poverty by engaging individuals in exercising their personal and political power to promote effective solutions and key policies that affect hunger and poverty. RESULTS Educational Fund is committed to educating the public, the media, and leaders about issues related to poverty and hunger in the United States and abroad. The origins of Riders for Health are in the sport of motorcycle racing. Riders for Health ensures vehicles used for the delivery of health care and associated development in Africa are available for the maximum time at the minimum cost. The goal is to guarantee that completely reliable transport is available for the complete delivery of health services throughout Africa by 2015. Right To Play is an international athlete-driven humanitarian organization using sport and play to strengthen communities and encourage the healthy physical, social and emotional development of children in the world's most disadvantaged areas. Volunteer-driven programs teach critical life skills and values, promote vital health education and empower individuals and communities. Samaritan's Purse is an evangelical Christian organization providing spiritual and physical aid to people in need around the world. Projects in more than 100 countries focus on activities including HIV/AIDS ministries, and bringing children to America for life-saving treatments. A leading independent nonprofit humanitarian relief and development organization, Save the Children works in more than 40 countries throughout the developing world and the United States to create lasting, positive change in the lives of children in need. Through their campus chapters, the Student Campaign for Child Survival is dedicated to raising awareness and promoting better policies regarding child survival as part of a broader global justice agenda. Through leadership training, grassroots organizing, transformative education and direct action, SCCS seeks to mobilize a diverse movement of US students, in partnership with students internationally, to advocate for a more engaged role by government, corporations and civil society in promoting child survival programs. The leading children's organization in the world, UNICEF was founded in 1946 to save, protect, and improve the lives of children and their families. UNICEF's lifesaving programs include immunization, health care, HIV/AIDS prevention, nutrition, clean water and sanitation, emergency relief, child protection, and education. UNICEF promotes the rights of all children and its cooperation is free of discrimination. In everything it does, the most disadvantaged children and the countries in greatest need have priority. The US Coalition for Child Survival is a collaboration of organizations and individuals dedicated to improving the survival and healthy development of the world's children. The Coalition seeks increased public and private funding for child survival, shares best practices between organizations in the field, and coordinates efforts to eliminate and eradicate diseases that kill children. This is accomplished by providing information and serving as a resource to child survival advocates. The Vaccine Fund harnesses the resources of the Global Alliance for Vaccines and Immunization (GAVI) — a partnership of international organizations, governments, the pharmaceutical industry, philanthropic organizations, and research groups — to address the needs for vaccines and immunizations in the world's poorest countries as well as China, India and Indonesia. The Fund provides financing for immunization services and for purchasing new and under-utilized vaccines against diseases such as Hepatitis B, Yellow Fever, and Haemophilus Influenzae-B. Vitamin Angels provides basic nutrition to people in need around the world. 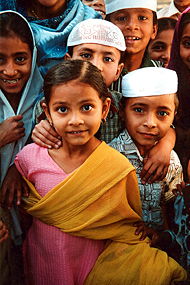 In 2004, Vitamin Angels distributed 23.4 million supplements to children and adults in 40 countries. The organization operates under the belief that every person has a right to basic nutrition, that vitamin deficiency diseases are preventable, and that education, in addition to supplementation, is the key to long term health. The World Fellowship of Buddhists (WFB) represents the common interests of Buddhists throughout the world. Among its objectives is to organize and maintain, or assist in the organization and maintenance of, institutions for social, educational, cultural, and other humanitarian services. World Vision is a Christian relief and development organization dedicated to helping children and their communities worldwide reach their full potential by tackling the causes of poverty. This is accomplished through child sponsorship opportunities, and donations to help improve access to basic things including clothing, food, healthcare, and safe drinking water.